Is there pain in the front part of your foot just before or over the forefoot bones? Do you always have a feeling that there is a pebble in the shoe or wrinkle in the sock? Is wearing high heels a part of your daily routine? Do you regularly participate in high-impact activities that involve running or jumping? If you answered yes to two or more of the four questions, you might be experiencing a condition called Morton’s Neuroma. What are the risk factors for Morton’s neuroma? 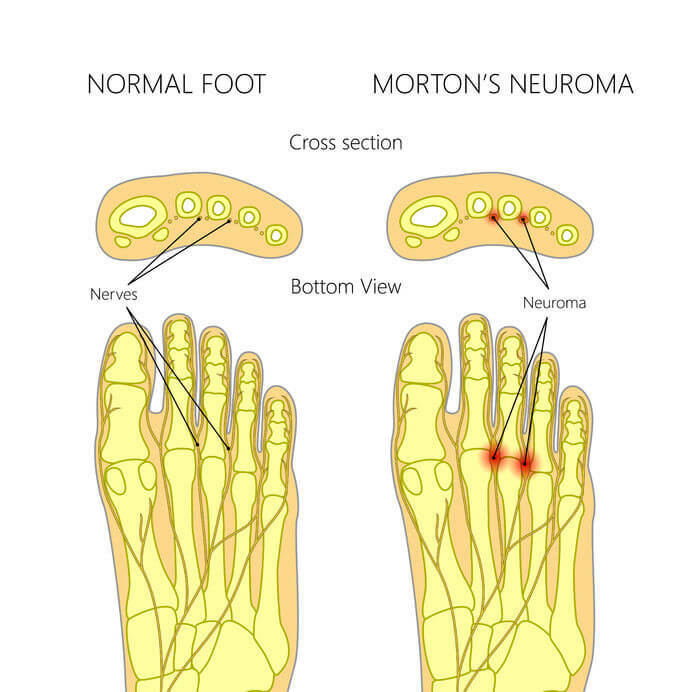 How to Diagnose Morton’s neuroma? Morton’s neuroma is irritation of one of the nerves in between the forefoot bones, particularly the nerve between 3rd and 4th bone. It gets so severe sometimes that a mass is palpable over the sole aspect of the forefoot directly above the affected nerve. The mass is a byproduct of thickening and scarring (also known as fibrosis) of the nerve due to repetitive injury or overuse. The risk factors for Morton’s neuroma will be discussed shortly. The common presentation is pain over the forefoot. This can be accompanied by radiating pain or tingling sensation of the two toes that the affected nerve gives sensation to. This is even magnified when the mass is palpated coupled with squeezing the ends of the forefoot bones together (Caution: This maneuver should be done only by a professional and should not be done at home as it may induce severe pain or tingling sensation). Compression of the nerve or excessive loading of the forefoot can cause forefoot nerve irritation. Here are some of the risk factors. Females commonly complain of this condition compared to males. This is probably due to footwear preference. Narrow Toe Boxes – Narrow-toe boxes will cramp the forefoot for proper fitting. This will compress the forefoot and the nerves in between. Compressing the nerves for a prolonged period repetitively will irritate the nerves and may eventually cause Morton’s neuroma. Elevated Heels – Wearing of high heels places excess load on the forefoot and may cause repetitive injury. Flat shoes are more preferred because it distributes the body weight more evenly on all areas of the foot. Activities that require frequent jumping or sprinting (i.e. basketball, volleyball) places a person at increased of acquiring Morton’s neuroma. These activities place the entirety of the body weight over the forefoot. Over the time, extreme weight bearing will take its toll on the forefoot and cause pain and possibly Morton’s neuroma. Morton’s neuroma diagnosis is by history taking and physical examination by a licensed physician; therefore, a consult should be done in case you have the abovementioned symptoms and risk factors. X-ray films are not necessary unless there is suspicion of a fracture. The mainstay of treatment is to unload the forefoot by correcting daily habits such as wearing of flat shoes instead of elevated heels or training patterns (i.e. more jogging than sprinting to reduce load on the forefoot). Using shoes with a wide toe box also prevents compression of the nerves. A metatarsal gel pad insert or using premetatarsal pads can work wonders. The pads are placed just before the forefoot bones to relieve pressure. This allows the injured nerves to rest and recover. Combining this with correction of habits often produce a favorable response to the condition. Custom-made foot orthoses can be designed to distribute weight forces evenly along the foot but is an expensive treatment choice. Orthoses are offered if there is no favorable response to treatment numbers one and two. Injection of corticosteroid and anesthesia directly into the nerve can be done if there is no response to conservative treatment. This method hits two birds with one stone. It confirms diagnosis of neuroma while providing relief. Surgical excision is reserved for severe cases or persistent pain despite the aforementioned treatment options. FeetGenius brings you the most in-depth, evidence based information on keeping feet healthy and happy. 2018 © FeetGenius, All Rights Reserved.